As marketers try to determine appropriate resourcing, one of the big measurement and accountability challenges faced by social media is the anonymity inherent in most social data. Indeed, smart companies track social media’s impact on desirable behaviors such as lead generation, repeat website visits, and even corollation-derived ROI. But in almost every case, the evidence that social media “works” is based on aggregate, anonymous data. But by blending together social media listening and engagement software with customer relationship management (CRM) platforms, the promise and premise of social CRM is finally becoming a reality, 2-3 years after we started to trumpet it (more optimistically than realistically at first). Do you think Salesforce.com and Oracle spent more than 1.5 BILLION dollars on Radian6, Buddy Media, Vitrue, and Collective Intellect because they thought they could be the long-term kings of custom Facebook tab deployment? No. That business model has the sustainability of an ice cream cone in July. All Facebook has to do is roll out their own tab builder, and it’s curtains. Instead, the software titans bought the ability to combine social behavior with their existing database and CRM suites to create a true end-to-end social CRM solution. This is of course a powerful opportunity for business, as the ability to peer into the social media behaviors of individual customers and prospects across platforms and over the long term should enable companies to deliver more relevant, impactful social interactions. But, the companion to true social CRM may be social marketing automation, as predicted by Jeremiah Owyang in a recent article on TechCrunch. That will make the category a lot more about the media than it is about the social, and while the operating efficiencies of robotic social are intriguing, the lack of humanity is inherently unsocial. That’s a discussion for another day, however. What troubles me about social CRM right now is that merger mania is congealing and coalescing social marketing into a few large platforms. It’s a competitive landscape reminiscent of television circa 1985, if you replace the Big Three of CBS, NBC, ABC with the Social Big Three of Salesforce, Oracle, and Adobe. For enterprise companies, this is probably good news, as using a single large technology platform for all CRM planks (including social) will reduce complexity and potential points of failure. But what of the mid-market? Not every company wants or needs a comprehensive, enterprise-class technology platform. If you don’t want to eat as much sandwich as the Social Big Three wants to offer, what then? Most software companies want to sell to the enterprise market because the average price tag and reduced number of total customers to support is an efficient way to generate revenue, even though there are fewer than 10,000 total companies in the U.S. with 1,000 or more employees. Yet, nearly every social media marketing software company is trying to move up the ladder and sell to the big guys. Alternatively, you have companies that target the other side of equation, hoping to gain a low cost, low margin foothold in the huge (more than 5 million U.S. companies) small business market. The mid-market is tougher sledding, and is often ignored. The numbers are there, as there are some 27,000 companies in the U.S. with 500-1000 employees, and 117,000 with 100-1000 employees. But software targeted at the mid-market often takes longer to gain traction, as prospective customers try enterprise and/or small business oriented alternatives first, before realizing that the former is too expensive or complex, and the latter lacks key features. It’s the Goldilocks Syndrome. Companies need to experience the shortcomings of their first choice before realizing that the mid-market focused option is just right. (The same thing happens in consulting). Last week was a big one for the mid-market alternatives to the Social Big Three, with two huge announcements that ensure that social CRM won’t strictly be a plaything of enterprise corporations. Argyle Social (sponsors of this blog and the Social Pros podcast, and what I personally use for social communication) launched their Social API. It allows companies (targeted at mid-market) to connect rich and specific social behavior information at the prospect level with third-party databases (a Salesforce integration is available now) to create a robust yet affordable “roll your own” social CRM system. It tracks content and click behaviors across the social Web, and ties them into website behaviors such as visits to key pages and downloads, and synchs it with your database records. So, your sales and marketing teams can know that Bill Johnson clicked this tweet, and that tweet, and that other Facebook status update, and then went to the site three times, and then downloaded the white paper, etc. Powerful information that will increase sales conversion rates. This new ability to understand behavior at the individual customer level can change the very nature of the social marketer’s job. Argyle Social calls this the difference between being an Oceanographer, scanning the waves for patterns; and a Fisherman, baiting the hook to reel in a specific catch. It’s an interesting concept, and you should check out their new whitepaper, If You Teach a Community Manager to Fish. In other mid-market social CRM news, Hubspot and Hootsuite announced an integration that combines Hootsuite’s social behavior data (historically a favorite of small business) with Hubspot’s robust database capabilities. This is definitely a 1+1=3 equation for current customers of Hubspot, as broad social behavior tracking has been the one shortcoming in what is otherwise a very solid package – especially for content marketing devotees. The companies are calling this new partnership Closed Loop Social, with an emphasis on using social in addition to or in lieu of email within the sales funnel. Sounds about right to me. It’s currently in closed beta. Visit this application form to request participation. True social integration is no longer in the leprechaun and unicorn category. It exists. It’s doable. 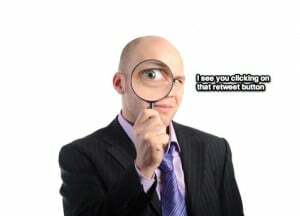 You can do more with your social marketing than just calculate retweets and YouTube views. Certainly for big companies, there are several outstanding options on the way from the Social Big Three once they digest their new acquisitions (and watch for more on the way). 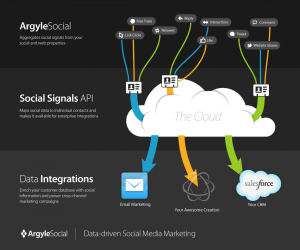 For the mid-market, however, you can start adding CRM to your social immediately using the Argyle Social API or (soon) the Hubspot/Hootsuite combination. It’s an exciting time in social marketing, as we’re moving from back pats to business. Are you ready?